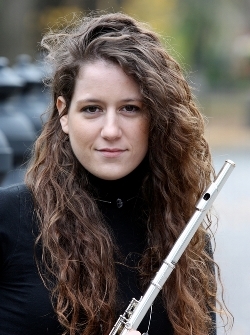 Rose Lombardo was appointed Principal Flute of the San Diego Symphony in 2011 at the age of 23. At the time, she was in her second year of graduate studies with Jim Walker at the Colburn School Conservatory of Music in Los Angeles and graduated with a Professional Studies Certificate. Previously, Ms. Lombardo earned a Bachelor of Music degree from The Juilliard School where she studied with Jeffrey Khaner. Ms. Lombardo has traveled across the globe as an orchestral, chamber and solo artist. Her solo recitals have taken her from Boston to Europe and to China, and she has had the privilege of collaborating with some of the finest musicians in the most beautiful halls around the world, including Carnegie Hall, Bolshoi Zal at the St. Petersburg Philharmonia, Suntory Hall, Seiji Ozawa Hall, Jordan Hall and Boston Symphony Hall. Chamber music collaborations include performing alongside musicians from the Cincinnati Symphony, Chicago Symphony Orchestra, Berlin Philharmonic, Vienna Philharmonic and William Christie’s early music ensemble, Les Arts Florissants. Ms. Lombardo performs regularly in San Diego with the Art of Élan and San Diego Symphony Chamber Music Series. Ms. Lombardo has appeared as principal flute in numerous summer music festivals, including the 2008 Pacific Music Festival in Sapporo, Japan, the 2011 Spoleto Music Festival USA in Charleston, South Carolina, and the 2012 Sunflower Music Festival in Topeka, Kansas. Most recently Rose Lombardo performed as principal flutist with the 2013 Artosphere Festival Orchestra in Fayetteville, Arkansas. Q: What are three of your favorite tunes or pieces in your iPod or mp3 or CD collection? Q: How did you choose your instrument? A: I started playing the piano at age five, but the first time my mom brought me to hear the Boston Symphony I knew I had to play the flute in an orchestra. My ears were immediately drawn to the flute sound soaring above, and I wanted to be part of the mesmerizing orchestral experience. Q: What are your favorite travel destinations? A: Home to Massachusetts and any place I haven't seen before, preferably with a perfect right point break out front. I am obsessed with traveling. A: I love living next to the ocean and getting to experience it on a daily basis. Q: What are some of your favorite San Diego restaurants? Q: Where might you be found on a Saturday night if the Orchestra is not performing? A: Watching a movie, hanging with friends or out listening to live music. Q: The non-musical accomplishment you are most proud of is…? A: I won first place dancing the "hornpipe" at an Irish step dance feis (festival). In August 2013 The Patriot Ledger in Quincy, MA published an article about Rose Lombardo: "World class flutist and Norwell native Rose Lombardo returns for a South Shore performance."